A few weeks ago, the thrift stores started to put out all their holiday items and so started the hunt for new-to-me treasures for my holiday decorating. 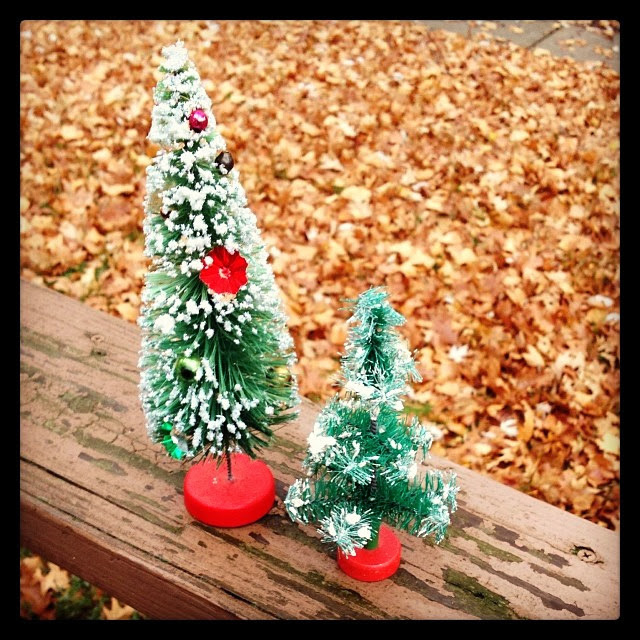 Above is the first Christmas purchases of the season! 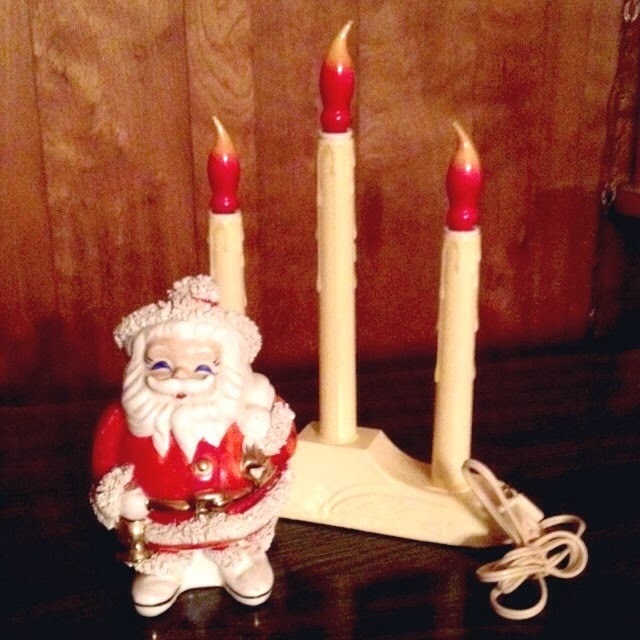 The spaghetti santa is in rough shape; both of his feet have been glued back on and some of his paint has rubbed off; but he was only $1 and I plan to make one of THESE with him. I got the candles for the bulbs, aren't they neat? I took advantage of the Veteran's Day sale Joann Fabrics was having to stock up on some holiday fabric. 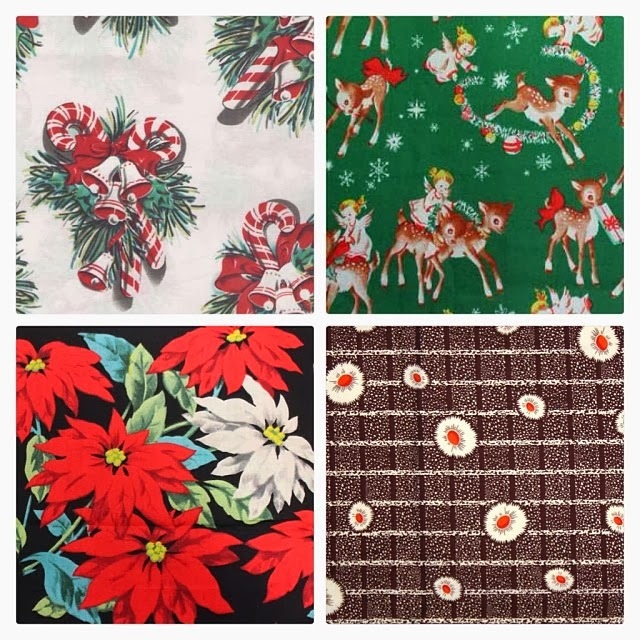 The poinsettia and candy cane fabrics are going to be made into Christmas Swirl dresses, which I am SO excited about! There was only one yard left of the sweet deer fabric, so I got it anyway and am putting it away for now. I think it would make an adorable little girls dress, don you? The brown print is what I am making my Thanksgiving dress out of. See more of that soon! 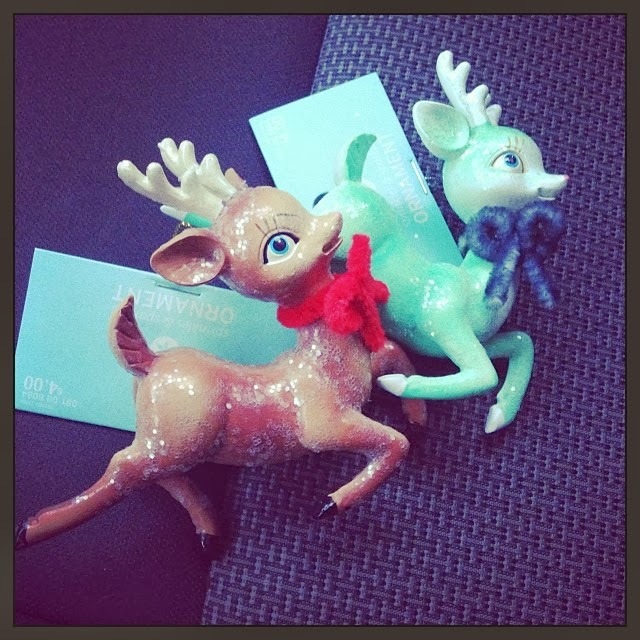 Aren't these deer ornaments cute? And oh so retro! I found them at Target, which by the way, has quite a few retro Christmas items this year. The aqua one is being used in a craft project I will be sharing next month on the blog and the brown one will make its way to my tree. I just picked up these bottle brush trees yesterday at the Royal Oak Flea Market for $5 total. The taller one has a lot of little embellishments in it, like mercury glass ornaments and mini reflectors. The smaller one is tiered and haven't ever seen one like it before, so I had to get it for my collection. I think I might finally have enough to start THIS kind of display. 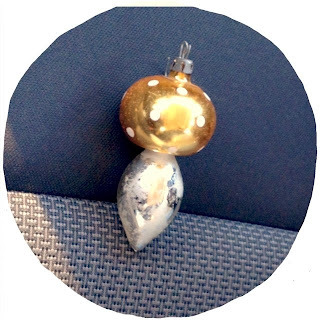 I thrifted this little guy last week and was so thrilled to have pulled it out of the bottom of a basket of ornaments at the thrift. I had been eyeing similar ones online.